A retired FBI agent has thrown his professional weight behind the pardon case for Jens Soering, the German national convicted of the brutal murder of a Bedford County couple in 1985. And new evidence of a once-lost FBI profile — presented at a news conference in Charlottesville on Monday — points to a female killer who knew the family intimately. On April 3, 1985, Derek and Nancy Haysom were found dead in their Lynchburg home — their throats cut from ear to ear and their bodies extensively mutilated by knife wounds four days earlier. In 1990, the couple’s daughter, Elizabeth Haysom, was found guilty of being an accessory, while Soering, her boyfriend at the time, was convicted of both murders. They were both University of Virginia honors students at the time of the killings. 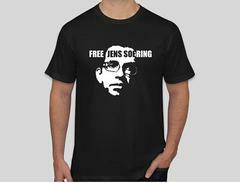 Soering is serving two life sentences. Haysom is serving a 90-year sentence but will receive mandatory parole in 2032, when she is 68. Stanley Lapekas, a retired special agent with the FBI, became involved with the case about six months ago, after working on another wrongful conviction case with Albemarle County Sheriff Chip Harding, who is spearheading the unofficial Soering investigation. But criticizing the work of other law enforcement officers — however long ago — is never a comfortable task, Lapekas said in a recent interview. “I look at this to try to identify things that are possibly new or just ‘glow’ and make me say, ‘Something isn’t right here,’” he said. And a few things stood out for the retired agent. First, Lapekas found it odd that there was a disagreement between the original investigators as to whether the FBI conducted a psychological profile of the killer. Major Ricky Gardner, with the Bedford County Sheriff’s Office, contends a profile was never done, but in an interview before he passed away, FBI Special Agent Edward Sulzbach spoke about the profile he completed at the request of the sheriff’s office, just days after the crime scene was discovered. Retired Bedford County Investigator Chuck Reid also remembers a profile being done, and that he does not understand why Gardner would deny its existence. For the first six months of the investigation, he said, detectives focused on a female suspect. But then Soering confessed to the crime and the six months of work was “thrown out of the window,” Reid said. Evidence was spun to fit Soering’s story, rather than investigated for the truth, he said. Gardner did not return calls for comment. Lapekas filed a series of Freedom of Information Act requests with the FBI to try to find any mention of such a profile. A couple of the documents he received do mention some redacted information from the profile — identifying the possible suspect as a white female who is “very closely related to the victims” — but the actual profile report was not found. In 1985, the Richmond FBI office was a pilot location for the bureau’s efforts to switch from paper to electronic filing. As a result, Lapekas said, it’s possible some documents got lost in the shuffle. And it may never have been a written report, he said, but the information was definitely relayed to then-Bedford County Commonwealth’s Attorney John Updike because he mentions it in a letter and a rough draft affidavit to the attorney of a woman who was considered a suspect in 1985. The woman was the ex-fiancée of Haysom’s brother, who reportedly blamed their parents for the broken engagement. “Moreover, Special Agent Edward F. Sulzbach of the Federal Bureau of Investigation, who is trained in the field of compiling profiles of criminal suspects, viewed the scene and the evidence gathered during the investigation and stated that the suspect was female and knew the victims,” according to the affidavit. The woman eventually was eliminated as a suspect, but the profile was never introduced at trial or brought up by Soering’s defense, according to Harding. “It was buried,” Harding said. The second piece of evidence that caught Lapekas’ eye was the bloody sock print that the prosecution used to tie Soering to the scene. In the psychological profile, Sulzbach determined the print matched a woman’s foot with a shoe size of 6 ½ to 7 or a small man’s foot, size 5 to 6. Soering is a size 8 ½ to 9, according to Harding, who said the shoe size likely matched that of Haysom. At the trial, a tire impression expert testified that the print matched an overlay of an inked impression of Soering’s foot. “In my opinion, that is basically junk science and no better than a cheap magic trick,” Lapekas said. Other than that, and some Type O blood found at the scene that prosecutors said belonged to Soering, there was no other physical evidence linking him to the scene. And since a DNA test was done on the remaining blood samples in 2009, Soering was eliminated as a contributor of that blood — striking any physical evidence tying him to the scene, Lapekas said. Speaking candidly, Lapekas said he wants to get to the truth of a case, even 30 years on. Since the DNA testing was done, a question has been raised that there might have been one or two unidentified men at the crime scene. Lapekas also questioned the Bedford County’s investigators’ decision to focus on Soering when the evidence did not really match up to his story. With Soering telling one story and Haysom telling another, he said it should have been the first priority to sort out which story held the most water. While Harding, Lapekas and others continue their investigation, Soering remains in the Buckingham Correctional Center. Sitting at a conference table in a cinderblock room, just a few paces away from the prison warden’s office, Soering pulls out half a dozen hefty binders. Each tome consists of the documents and evidence collected to bolster his pardon request. And Soering knows it all back to front and sideways. There’s not a lot to do in prison, he said, except to try to help his own case. In February, Soering was denied parole for the 14th time. Even though officials from Germany threw their support behind him at his parole hearing and offered to take him home, the one-page letter Soering received on Feb. 23 was straightforward. The letter said he was being denied parole because of the serious nature and circumstances of the crime. “While this may not be the answer you hoped for, please continue your hard work,” it said. But he can always apply again, every year. Adrianne Bennett, chairwoman of the Virginia Parole Board, which also is in charge of pardon investigations, confirmed to Virginia Public Radio that the investigation of Soering’s case is ongoing and has been since April 2016. She said the “constant flow of new information” has contributed to the lengthy process and that other pardon requests have taken years to complete. Bennett could not be reached for comment by press time. The board typically receives 15 to 25 pardon requests per week, officials said. Former Gov. Terry McAuliffe never had a chance to look at Soering’s case and it now falls to recently elected Gov. Ralph Northam. “I’ve been fighting so long and so hard,” said Soering, who has now been locked up for almost 32 years. 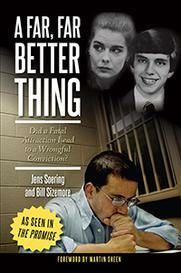 When he talks about his false confession, Soering shakes his head at his younger self. He said he was never trying to cover up a crime; he was trying to save Haysom from the electric chair. If Virginia didn’t have the death penalty, he said he never would have done it.